Is Sony just a bit too late out of the starting blocks on this one? Sony has launched a new weblog dedicated to all-things PlayStation related. The Japanese giant says it's a new "platform for conversation and connection" for the fans. 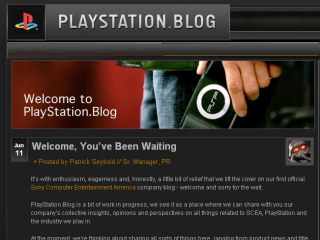 "It's with enthusiasm, eagerness and, honestly, a little bit of relief that we lift the cover on our first official Sony Computer Entertainment America company blog - welcome and sorry for the wait," reads the latest entry on the new site. "At the moment, we're thinking about sharing all sorts of things here, ranging from product news and title announcements to developer updates and industry opinion posts - all of which will come straight from the people here inside SCEA who are working, thinking and playing with this stuff every day," it says. PlayStation fans are encouraged to give their opinions and vent their frustrations in the blog's comments section. It's definitely something to keep your eye on if you're a PlayStation nut who just can't get enough.